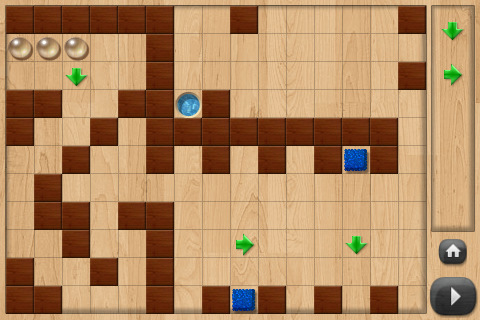 Dribble is a puzzle game app. by Dennis Kulakov where your objective is to help four clear/white drops navigate their way through a maze puzzle to reach the blue funnel so you can move onto the next puzzle. Since the drops naturally turn to the right unless they have specific directions, you have to place the green arrow(s) that are provided to the right onto the puzzle to help the drops get to the funnel. You can’t place them on the puzzle while the drops are moving, though- you have to place them on before hand and then press the play button that is in the bottom right hand corner. If you placed them in the wrong spot on accident, you can pause the puzzle and re-place them in a better spot. Each puzzle only gives you the exact number of arrows you will need to get your drops to the funnel, so use them wisely. There are also some scary, fuzzy blue squares floating around the puzzle that will kill your drops if you run into them. If you manage to place the arrows correctly, avoid the blue squares, and get to the funnel, then the next level will be unlocked. There are forty (40) levels total. You can exit each puzzle by tapping the home icon that is located right above the play/pause button in the lower right hand corner. The main menu has a small “How to play” section and an “Options” section that allows you to turn the music and sound on or off and reset all the maps (puzzles) if you wanted to. I’m assuming this would just lock everything back up that you already unlocked. I definitely opted to turn the music off. It’s pretty cute at first, but the calypso type beat coupled with bubble sounds and high pitched taps became too much for me. The other thing I don’t love about Dribble is the placing of the arrows only being possible when the game isn’t actually moving seems kind of like cheating. I think it would be more fun if you had to place the arrows while the drops were moving and the blue squares were coming at you (and/or if the arrows couldn’t be re-positioned once set down). If you like a simpler puzzle game, then this app. has a ton of puzzles for you to play. If 40 puzzles are worth $1.99 to you, then Dribble awaits! AppSafari review of Dribble was written by Tyne Kennedy on May 19th, 2010 and categorized under App Store, Board, Fun, Games, Puzzler. Page viewed 4247 times, 2 so far today. Need help on using these apps? Please read the Help Page.